Malaria (Italian: "bad air"; formerly called ague or marsh fever in English) is an infectious disease which causes about 500 million infections and 2 million deaths annually, mainly in the tropics and sub-Saharan Africa. The protozoan cause of malaria was discovered by a French army doctor, Charles Louis Alphonse Laveran, for which he was awarded the Nobel Prize for Physiology or Medicine in 1907. 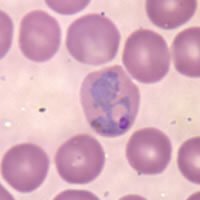 Malaria is caused by the protozoan parasite, Plasmodium (one of the Apicomplexa). The recognised species causing disease in man are P. falciparum (which alone accounts for 80% of the recognised cases and ~90% of the deaths) and P. vivax, but P. ovale, P. malariae, P. knowesli and P. semiovale are also known to cause malaria. The vector for human malarial parasite is the Anopheles mosquito. Other mammals (bats, rodents, non-human primates) as well as birds and reptiles also suffer from malaria. Symptoms of malaria include fever, shivering, arthralgia (joint pain), vomiting, and convulsions. There may be the feeling of tingling in the skin, particularly with malaria caused by P. falciparum. Complications of malaria include coma and death if untreated—young children are especially vulnerable. Infected female Anopheles mosquitoes carry Plasmodium sporozoites in their salivary glands. If they bite a person, which they usually do starting at dusk and during the night, the sporozoites enter the person's body via the mosquito's saliva, migrate to the liver where they multiply within hepatic liver cells. They then turn into merozoites which then enter red blood cells. There they multiply further, periodically breaking out of the red blood cells. The classical description of waves of fever coming every three or four days arises from simultaneous waves of merozoites breaking out of red blood cells during the same day. The parasite is relatively protected from attack by the body's immune system because it stays inside liver and blood cells. However, circulating infected blood cells are killed in the spleen. To avoid this fate, the parasite produces certain surface proteins which infected blood cells express on their cell surface, causing the blood cells to stick to the walls of blood vessels. These surface proteins are highly variable and cannot serve as a reliable target for the immune system. The stickiness of the red blood cells is particularly pronounced in Plasmodium falciparum malaria and this is the main factor giving rise to hemorrhagic complications of malaria. Some merozoites turn into male and female gametocytes. If a mosquito bites the infected person and picks up gametocytes with the blood, fertilization occurs in the mosquito's gut, new sporozoites develop and travel to the mosquito's salivary gland, completing the cycle. Pregnant women are especially attractive to the mosquitoes, and malaria in pregnant women is an important cause of still births and infant mortality. If diagnosed early, malaria can be treated, but prevention is always much better, and substances that inhibit the parasite are widely used by visitors to the tropics. Since the 17th century quinine has been the prophylactic of choice for malaria. The development of quinacrine, chloroquine, and primaquine in the 20th century reduced the reliance on quinine. These anti-malarial medications can be taken preventively, which is recommended for travellers to affected regions. Certain strains of Plasmodium have recently developed resistance to chloroquine which has been the first line of treatment in many countries, thus complicating the treatment. In West Africa, where the local strains of malaria are particularly virulent, mefloquine (trade name Lariam) is now the recommended prophylactic, despite causing psychological problems in some vulnerable people. Doxycycline, an antibiotic, is also prescribed as a prophylactic against quinine-resistant malaria, though its use is less common than Lariam because it must be consumed daily. It seems inevitable that resistance to these drugs will also occur. "Malarone" is also a recommended prophylactic. In addition to the antimalarial drugs, the use of mosquito repellents such as DEET, and mosquito nets and screens can reduce the chance of malaria, as well as the discomfort of insect bites. Extracts from the plant Artemisia (specifically Artemisia annua), containing the compound artemisinin, a substance unrelated to the quinine derivatives, offer some future promise. Vaccines for malaria are under development, with no completely effective vaccine yet available (as of November 2004). A team backed by the Gates Foundation and the pharma giant GlaxoSmithKline announced a partially successful field trial in October 2004, for RTS,S/AS02A, a vaccine which reduces infection risk by 30% and severity of infections by over 50%  (http://www.malariavaccine.org). Further necessary research will delay this vaccine from commercial release until around 2010. In January 2005 Edinburgh University scientists announced the discovery of an antibody which protects against the disease. The scientists will lead a £17m European consortium of malaria researchers  (http://news.scotsman.com/scotland.cfm?id=56062005). It is hoped that the genome sequence of the most deadly agent of malaria, Plasmodium falciparum, which was completed in 2002, will provide targets for new drugs or vaccines. Efforts to eradicate malaria by attacking mosquitos have been successful in some areas. Malaria was once common in the United States and southern Europe, but the draining of wetland breeding grounds and better sanitation eliminated it from affluent regions. Sterile insect technique is emerging as a potential method to control malaria-carrying mosquitos. Progress towards transgenic, or genetically modified insects suggests that wild mosquito populations could be made malaria resistant. Researchers at Imperial College London created the world's first transgenic malaria mosquito  (http://www.ic.ac.uk/templates/text_3.asp?P=1911), with the first plasmodium resisting species announced by a team at Case Western Reserve University, Ohio in 2002 (See Jacobs-Lorena et al, 2002)  (http://www.cwru.edu/pubaff/univcomm/2002/may/mosquito.htm). Since most of the deaths today occur in poor rural areas of Africa which lack health care, the distribution to children of mosquito nets impregnated with insect repellants has been suggested as the most cost-effective prevention method. These nets can often be obtained for less than US$10 or 10 euros when purchased in bulk from the United Nations or other organizations, and need to be re-impregnated with the chemical about every six months. Malaria was eliminated from the northern parts of the USA in the early twentieth century, and the use of the pesticide DDT during the 1950s eliminated it from the south. Spraying interior walls with DDT, in areas where the mosquitoes are not already DDT-resistant, is also effective. This public health use of small amounts of DDT is allowed for in the Stockholm Convention on persistent organic pollutants (POPs) which prohibits the agricultural use of DDT  (http://www.pops.int/) for large-scale field spraying. DDT was developed as the first of the modern insecticides early in World War II. It was initially used with great effect to combat mosquitoes spreading malaria. It was banned for use in many countries in the 1970s due to its negative environmental impact. There is great controversy regarding this impact and the use of DDT to fight human diseases. Some claim that the ban is responsible for malaria deaths counted in tens of millions in tropical countries where the disease had been under control. Carriers of the sickle cell anaemia gene are protected against malaria because of their particular hemoglobin mutation; this explains why sickle cell anemia is particularly common among people of African origin. There is a theory that another hemoglobin mutation, which causes the genetic disease thalassemia, may also give its carriers an enhanced immunity to malaria. Another disease that gives protection against malaria is glucose-6-phosphate dehydrogenase deficiency (G6PD). It protects against malaria caused by Plasmodium falciparum as the presence of this enzyme is critical to survival of these parasites within red blood cells. It is thought that humans have been affected by malaria for about 50,000 years, and several human genes responsible for blood cell proteins and the immune system have been shaped by the struggle against the parasite.